Thanksgiving Archive Recipes This archive is from the Pioneer Woman. If you are looking for basic thanksgiving recipes I really, really, really recommend checking this archive out. Again, this is tutorial with pictures that guide you every step of the way teaching you how to make turkey, cranberry sauce, mashed potatoes and much more. Whenever I want to try a new recipe I always check out The Pioneer Woman cooks because she seriously takes a picture of EVERY single step which makes it easy to follow and hard to mess up. Pie Crust 101 Want to make flaky, buttery, delicious pie crust? I thought you did! Check out this post by Smitten Kitchen. 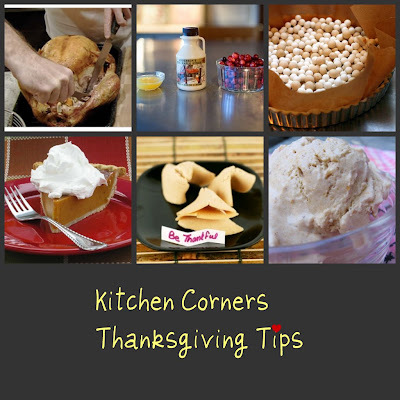 Thanksgiving Pie Recipes I really like this post because it gives you ideas on different kinds of pies you can make. The author of this post is all about making pies and has tested and retested all these recipes so you are sure to get a recipe that works. Taste Spotting Thanksgiving Taste Spotting is my favorite site to search for recipes and their Thanksgiving archive looks pretty delish with a variety of recipes ranging from your traditional pumpkin pie to curried pumpkin soup, plus lots of vegetarian and vegan ideas. Pumpkin Ice Cream A while back I shared my pumpkin pie recipe. You can revisit it and make it in time for tomorrow as an alternative (or an addition) to pumpkin pie. Wishing you and your family a lovely Thanksgiving! I LOOOOOOVE Thanksgiving. I'm so excited. curried pumpkin soup! yum. I'm so hungry right now! Those look delish! I hope your day was wonderful sweetie. Thank you for all that your doing for BD.